A young Bahamian, Claudette Andrea Durham–Rolle, was appointed Director of Catholic Education in 2003, after spending a year ‘shadowing’ her predecessor, Sister Mary Benedict Pratt OSB, in preparation for the weighty assignment. Well qualified for the post, Rolle’s educational achievements included an associate degree from the College of the Bahamas, a B. Ed from Duquesne University, Pittsburgh and a Master’s in Curriculum and Instruction from the University of St. Thomas. 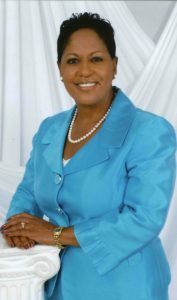 Rolle began her professional career in the Catholic system as a teacher at Mary, Star of the Sea in Freeport, Grand Bahama in September 1981 and was eventually appointed vice principal. She remained in that post until June 1993 and established the first computer and reading labs at the school. She also brought important innovations to St. Cecilia School in Nassau, when she was transferred to serve as principal there in 1993. She established a computer lab and introduced ‘Back-to-School Nights’ where parents were re-introduced, through instructional strategies, to ‘new math’ concepts. In 1999, during her tenure, twelve new classrooms were constructed and student enrolment increased to 400. Claudette Rolle took on new challenges as Curriculum Officer of the Catholic Board of Education from 2000 to 2002. Here too, she made her mark, introducing much needed upgrades. It was she who introduced common standards and benchmarks to the Catholic Education system for K-6 Language Arts and Mathematics, thus facilitating not only ease of movement from one school to next, but also permitting reliable quantitative assessment of achievement throughout the network of schools. Rolle continued to make significant enhancements to the Catholic school system as Director of Catholic Education. One of the most far reaching was the introduction of PowerSchool Electronic Student Management System which creates valuable databases and facilitates interaction between the parents and guardians and the school via the internet. Believing that elaborate sixth grade “graduations” tended to divert from attention from the fact that the primary school was merely an early step in education, Rolle recommended that such ceremonies be replaced by a combined Exodus Mass for all students matriculating to grade seven. The Board accepted the recommendation.